While exploring Beerwah, I came across a great little coffee shop called, Kwerky Cafe. I couldn't resist. I had to take a look and I have been a loyal customer ever since. From the moment I went inside I felt relaxed, welcomed and delighted with the food and beverages on offer. I had discovered a wonderful coffee retreat from the world. This kwerky little cafe is filled with bright painted walls: orange, yellow and green. It has a black and white checkered ceiling plus a pole dancing pole which is a bit of a talking point. 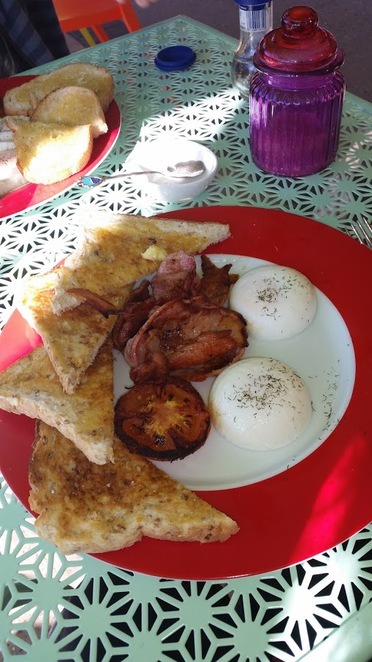 Kwerky Cafe is imbued with artistic flair and there's a comfy lounge to sit in, savvy vintage furniture, tables for two and seating outside in the sun where you can watch the goings on of Beerwah while sipping an artistic coffee. The cafe is filled with delightful art and craft items to discover too. If you love handmade items, you may want to check out their crochet collection and other small items on the bookshelf. Original art hanging from the walls, crochet, tea pots cosies and other wonders sit waiting to be discovered. There are kwerky and cool artworks on the wall and bright canvases where people from all walks of life write something interesting on a note and pin it up to share with other patrons. Children delight in doing this and leaving messages for Jodie, the owner. It's fun for everyone. Kwerky Cafe has a range of food and beverage (tea, coffees, and juice) options too. Fresh made juices to cleanse, uplift and refresh your body - you could enjoy a Sunshine Twist (Orange, Apple and Pineapple) or a Kwerky Cleanser (Pineapple, Watermelon, Carrot, Celery and Ginger) or explore their other juice options. 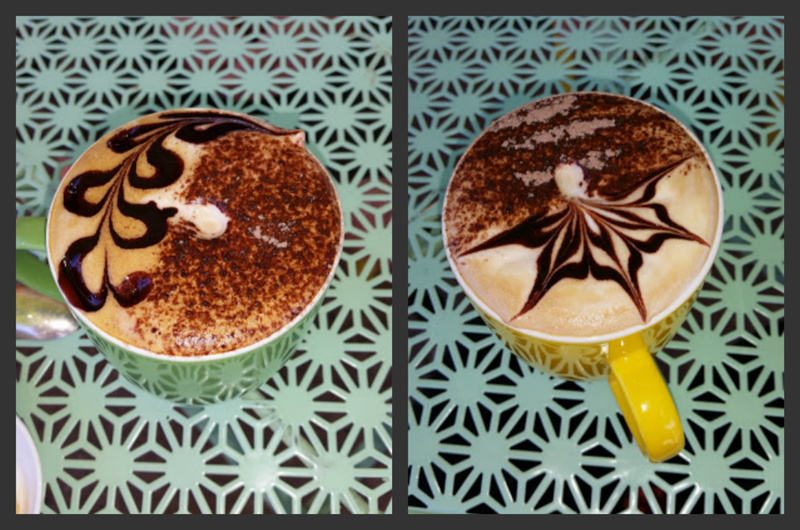 The cappuccinos (my favourite) arrive with artistic patterns on one side of the froth and delicious chocolate on the other half. Coffee is accompanied by a small shortbread biscuit made by Jodie, which melt in your mouth and taste divine! Kwerky Cafe source their coffee beans from Kunda Park Maroochydore and they are locally roasted. Kwerky Cafe are located directly across from the Beerwah train station and have been there for almost a year. And for those people enjoy creating art, Kwerky Cafe will be the site for once a month art classes using mixed media and art journals. Dates are yet to be confirmed, but it's worth asking about if you're interested. Kwerky Cafe's atmosphere is welcoming, warm, sunny and a peaceful yet kwerky retreat from everyday life. So, make sure you stop by and enjoy a little Kwerky hospitality when you're in town. Why? It's a fun, warm and friendly place to meet for coffee with family and friends. When: Mon to Fri 8am to 4pm and Sat 8am to 2pm. Not open on public holidays. Cost: Coffee start at $4.00; Food items start around $2.50 for toast and $6.00 for sandwiches. See menu for specific details. What a find! I like the clever way the coffee is served, the room colours, the art and tabletops. I will have to schedule a visit. I love the aesthetics of the place; it looks bright and cheery. They go All out on their coffee designs too. What a fun and inviting cafe! Wow! It is a great place to take your older guests, too. The cafe is quiet, and you don't have to make yourself heard over the coffee machine. I took my 80 year old Mum in today for a coffee and juice. She usually struggles with the noises of coffee machines, loud clanging and voices. Kwerky is an oasis. What a great cafe great coffee and great Brekkie. The best cafe in Beerwah. Do your self a favour try it out you wont be sorry.